India is one of the oldest civilizations with a kaleidoscopic variety and rich cultural heritage. It has achieved multifaceted socio-economic progress during the last 72 years of its Independence. India has become self- sufficient in agricultural production and is now the tenth industrialized country in the world and the sixth nation to have gone into outer space to conquer nature for the benefit of the people. It covers an area of 32,87,263 sq km, extending from the snow-covered Himalayan heights to the tropical rain forests of the south. As the seventh largest country in the world, India stands apart from the rest of Asia, marked off as it is by mountains and the sea, which give the country a distinct geographical entity. Bounded by the great Himalayas in the north, it stretches southwards and at the Tropic of cancer, tapers off into the India ocean between the Bay of Bengal on the east and the Arabian sea on the west. Lying entirely in the northern hemisphere, the mainland extends between latitudes 8°4' and 37°6' north, longitudes 68°7' and 97°25' east and measures about 3,214 km from north to south between the extreme latitudes and about 2,933 km from east to west between the extreme longitudes. It has a land frontier of about 15,200 km. The total length of the coastline of the mainland, Lakshadweep Islands and Andaman and Nicobar Islands, is 7,516.6 km. Countries having a common border with India are Afghanistan and Pakistan to north-west, China, Bhutan and Nepal to north, Myanmar to the east and Bangladesh to the east of West Bengal. Sri Lanka is separated from India by a narrow channel of sea formed by the Palk Strait and the Gulf of Mannar. The mainland comprises four regions, namely, the great mountain zone, plains of the Ganga and the Indus, the desert region and the southern Peninsula. The Himalayas comprise three almost parallel ranges interspersed with large plateaus and valleys, some of which, like the Kashmir and Kullu valleys, are fertile, extensive and of great scenic beauty. Some of the highest peaks in the world are found in these ranges. The high altitudes limit travel only to a few passes, notably the Jelep La and Nathu La on the main Indo-Tibet trade route through the Chumbi Valley, north-east of Darjiling and Shipki La in the Satluj Valley, north-east of Kalpa (Kinnaur). The mountain wall extends over a distance of about 2,400 km with a varying depth of 240 to 320 km. In the east, between India and Myanmar and India and Bangladesh, hill ranges are much lower. Garo, Khasi, Jaintia and Naga Hills, north-south. The plains of the Ganga and the Indus, about 2,400 km long and 240 to 320 km broad, are formed by basins of three distinct river systems - the Indus, the Ganga and the Brahmaputra. They are one of the world's greatest stretches of flat alluvium and also one of the most densely populated areas on the earth. Between the Yamuna at Delhi and the Bay of Bengal, nearly 1,600 km away, there is a drop of only 200 metres in elevation. The desert region can be divided into two parts - the great desert and the little desert. The great desert extends from the edge of the Rann of Kuchch beyond the Luni river northward. The whole of the Rajasthan-Sind frontier runs through this. The little desert extends from the Luni between Jaisalmer and Jodhpur upto northern wastes. Between the great and the little deserts lies a zone of absolutely sterile country, consisting of rocky land cut up by limestone ridges. The Peninsular Plateau is marked off from the plains of the Ganga and the Indus by a mass of mountain and hill ranges varying from 460 to 1,220 metres in height. Prominent among these are the Aravalli, Vindhya, Satpura, Maikala and Ajanta. The Peninsula is flanked on the one side by the Eastern Ghats where average elevation is about 610 metres and on the other by the Western Ghats where it is generally from 915 to 1,220 metres, rising in places to over 2,440 metres. Between the Western Ghats and the Arabian sea lies a narrow coastal strip, while between Eastern Ghats and the Bay of Bengal there is a broader coastal area. The southern point of plateau is formed by the Nilgiri Hills where the Eastern and the Western Ghats meet. The Cardamom Hills lying beyond may be regarded as a continuation of the Western Ghats. The geological regions broadly follow the physical and may be grouped into three regions: the Himalayas and their associated group of mountains, the Indo-Ganga Plain and the Peninsular Shield. The Himalayan mountain belt to the north and the Naga-Lushai mountain in the east, are the regions of mountain-building movement. Most of this area, now presenting some of the most magnificent mountain scenery in the world, was under marine conditions about 60 crore years ago. In a series of mountain building movements commencing about seven crore years ago, the sediments and the basement rocks rose to great heights. The weathering and erosive agencies worked on these to produce the relief seen today. The Indo-Ganga plains are a great alluvial tract that separates the Himalayas in the north form the Peninsula in the south. The Peninsula is a region of relative stability and rare seismic disturbances. Highly metamorphosed rocks of the earliest periods, dating back as far as 380 crore years, occur in the area; the rest being covered by the coastal-bearing Gondwana formations, lava flows belonging to the Deccan Trap formation and younger sediments. The Himalayan rivers are perennial as they are generally snow-fed and have reasonable flow throughout the year. During the monsoon the Himalayas receive very heavy rainfall and the rivers discharge the maximum quantity of water causing frequent floods. The Peninsular rivers are generally rain-fed and, therefore, fluctuate in volume. A large number of the streams are non-perennial. The streams of the inland drainage basin of western Rajasthan are few and far between. Most of them are of an ephemeral character. They drain towards the individual basins or salt lakes like the Sambhar or are lost in the sands having no outlet to the sea. The Luni is the only rivers of this category that drains into the Rann of Kuchch. The Ganga sub-basin which is a part of the larger Ganga-Brahmaputra-Meghana basin is the largest in India receiving waters from an area which comprises about one-quarter of the total area of the country. Its boundaries are well-defined by the Himalayas in the north and the Vindhyas in the south. The Ganga flows through Uttar Pradesh, Bihar and West Bengal in India and enters Bangladesh thereafter. It has two main headwaters in the Himalayas: the Bhagirathi and the Alaknanda, the former rising from the Gangotri glacier at Gomukh and the latter from a glacier short of the Alkapuri glacier. The Ganga is joined by a number of the Himalayan rivers including the Yamuna, Ghagra, Gomti Gandak and Kosi. The western-most river of the Ganga system is the Yamuna which rises from the Yamunotri glacier and joins the Ganga at Allahabad. Among important rivers flowing north from central India into the Yamuna/ Ganga are the Chambal, Betwa and Sone. The Brahmaputra and the Barak flowing from east to west in north-eastern region are international rivers and have immense water resources potential which is still in the initial stages of development. The Godavari in the southern Peninsula has the second largest river basin covering 10 percent of the area of India. Next to it is the Krishna basin in the region, while the Mahanadi has the third largest basin. The basin of the Narmada in the uplands of Deccan flowing to the Arabian Sea and of the Kaveri in the south falling into the Bay of Bengal are about the same size, though with different character and shape. Two other river systems, which are small but agriculturally important, are those of the Tapti in the north and Pennar in the south. These west coast rivers are of great importance as they contain as much as 11 percent of the country's water resources while draining about 0 percent of the land area. (iv) post-monsoon, also known as north-east monsoon in the southern Peninsula (October - December). India's climate is affected by two seasonal winds - the north-east monsoon and the south-west monsoon. The north-east monsoon commonly known as winter monsoon blows from land to sea whereas south-west monsoon known as summer monsoon blows from sea to land after crossing the Indian Ocean, the Arabian Sea and the Bay of Bengal. The south-west monsoon brings most of the rainfall during the year in the country. It is now possible to make forecast about the monsoon rains successfully with developed models and trained manpower. With a wide range of climatic conditions from the torrid to the arctic, India has a rich and varied vegetation, which only a few countries of comparable size possess. 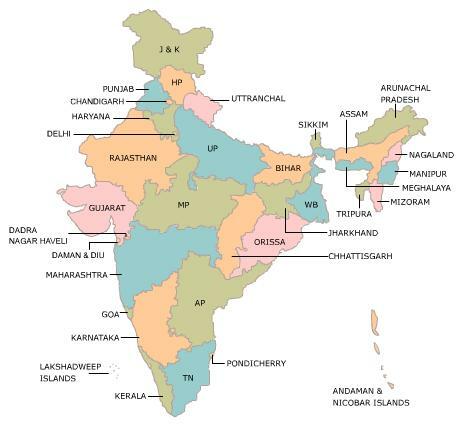 India can be divided into eight distinct floristic regions, namely, the western Himalayas , the eastern Himalayas, Assam, the Indus plain, the Ganga plain, the Deccan, Malabar and the Andamans. The Western Himalayan region extends from Kashmir to Kumaon. Its temperate zone is rich in forests of chir, pine, other conifers and broad-leaved temperate trees. Higher up, forests of deodar, blue pine, spruce and silver fir occur. The alpine zone extends form the upper limit of the temperate zone of about 4 ,750 metres or even higher. The characteristic trees of this zone are high-level silver fir silver birch and junipers. The eastern Himalayan region extends from Sikkim eastwards and embraces Darjiling, Kurseong and the adjacent tract. The temperate zone has forest of oaks, laurels, maples, rhododendrons, alder and birch. Many conifers, junipers and dwarf willows also occur here. The Assam region comprises the Brahmaputra and the Surma valleys with evergreen forests, occasional thick clumps of bamboos and tall grasses. The Indus plain region comprises the plains of Punjab, western Rajasthan and northern Gujarat. It is dry and hot and supports natural vegetation. The Ganga plain region covers the ar	ea which is alluvial plain and is under cultivation for wheat, sugarcane and rice. Only small areas support forests of widely differing types. The Deccan region comprises the entire table land of the Indian Peninsula and supports vegetation of various Kinds from scrub jungles to mixed deciduous forests. The Malabar region covers the excessively humid belt of mountain country parallel to the west coast of thee Peninsula. Besides being rich in forest vegetation, this region produces important commercial crop, such as coconut, betelnut, pepper, coffee and tea, rubber and cashewnut. The Andaman region abounds in evergreen, mangrove, beach and diluvial forests. The Himalayan region extending from Kashmir to Arunachal Pradesh through Nepal, Sikkim, Bhutan, Meghalaya and Nagaland and the Deccan Peninsula is rich in endemic flora, with a large number of plants which are not found elsewhere. India is rich in flora. Currently available data place India in the tenth position in the world and fourth in Asia in plant diversity. From about 70 percent geographical area surveyed so far, 49,000 species of plants have been described by the Botanical Survey of India. The vascular flora, which forms the conspicuous vegetation cover comprises 15,000 species. Of these, more than 35 percent is endemic and has so far not been reported anywhere in the world. The total plant wealth of the country includes not only the useful large flowered plants including flowering shrubs, but also a large number of non-flowering plants like ferns, liverworts, algae and fungi. The Zoological Survey of India (ZSI), with its headquarters in Calcutta and 16 regional stations located in different parts of the country, is responsible for surveying the faunal resource of the country. Possessing a tremendous diversity of climate and physical conditions, India has great variety of fauna numbering 81,251 species. Of these, insects constitute about 60,000, molluscs a little over 5,000, mammals 372, birds 1,228, reptiles 446, amphibians 204, and fishes 2,546. The mammals include the majestic elephant, the gaur or Indian bison - the largest of existing bovines, the great Indian rhinoceros, the gigantic wild sheep of the Himalayas, the swamp deer, the thamin spotted deer, nilgai, the four-horned antelope, the Indian antelope or black buck - the only representatives of these genera. Among the cats, the tiger and lion are the most magnificent of all; other splendid creatures such as the clouded leopard, the snow leopard, the marbled cat, etc., are also found. Many other species of mammals are remarkable for their beauty, coloring, grace and uniqueness. The abundant and colorful life of this country is one of its treasures. Several birds, like pheasants, geese, ducks, mynahs, parakeets, pigeons, cranes, hornbills and sunbirds, inhabit forests and wet lands. Rivers and lakes harbour crocodiles and gharials, the latter being the only representative of crocodilian order in the world. The salt water crocodile is found along the eastern coast and in the Andaman and Nicobar Islands. A project for breeding crocodiles started in 1974, has been instrumental in saving the crocodile from extinction. Twelve schemes are in operation in different states for breeding crocodiles. The great Himalayan range has a very interesting variety of fauna that includes the wild sheep and goats, markhor, ibex, shrew and tapir. The panda and the snow leopard are found in the upper reaches of the mountains. Depletion of vegetative cover due to expansion of agriculture, habitat destruction, over-exploitation, pollution, introduction of toxic imbalance in community structure, epidemics, floods, droughts and cyclones, contribute to the loss of flora and fauna. More that 77 species of mammals,72 species of birds, 17 species of reptiles, three species of amphibians, two species of fish and a large number of butterflies, moth and beetles are considered vulnerable and endangered. There are presently 84 national parks and 447 wildlife sanctuaries covering about 1.50 lakh sq km area which is nearly 4.5 percent of the total geographical area of the country. India is the cradle of the human race, the birthplace of human speech, the mother of history, the grandmother of legend, and the great grand mother of tradition. Our most valuable and most artistic materials in the history of man are treasured up in India only!